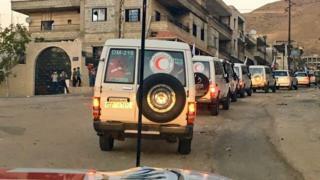 Aid has been delivered to four besieged towns in Syria for the first time in almost six months, the International Committee of the Red Cross says. Seventy-one lorries reached rebel-held Madaya and Zabadani, near Damascus, and government-controlled Foah and Kefraya, in Idlib province, on Sunday. They brought food, medical supplies and hygiene kits for 60,000 people. Last week, the UN suspended aid deliveries across Syria for 48 hours after a deadly attack on a convoy. The US and Russia, which support opposing sides in the country's five-year civil war, have blamed each other for the incident. It came as a week-old truce brokered by the two powers collapsed and the government's bombardment of rebel-held areas of Aleppo resumed. A monitoring group said dozens of air strikes hit the northern city and its surrounding countryside overnight, killing and wounding a number of people. The Syrian Observatory for Human Rights has documented the deaths of 237 people, including 38 children, in Aleppo since last Monday, when the truce ended. The ICRC, which managed the latest aid deliveries jointly with the Syrian Arab Red Crescent and the UN, announced that 53 lorries reached Madaya and Zabadani on Sunday afternoon. Some 40,000 people in the towns have been besieged since June 2015 by the Syrian army and allied fighters from Lebanon's Hezbollah movement. In early January, reports that children and old people were dying amid shortages of food, water and medicine in Madaya caused international outrage. The government was persuaded to allow in several aid convoys between January and April, but none included adequate food and medical supplies to stave off malnutrition for all the town's residents, according to US-based Physicians for Human Rights. The latest aid deliveries to Madaya and Zabadani were co-ordinated with the arrival of 18 lorries in Foah and Kefraya, where conditions are said to be similarly dire for their 20,000 residents. The two predominantly Shia towns, near the northern city of Idlib, were encircled by rebels and allied jihadists from Jabhat Fateh al-Sham in March 2015. Their electricity and water supplies have been cut since then and, while government aircraft have occasionally dropped aid over the areas, there are grave shortages of food and medicine. The UN estimates that 13.5 million people are in need of humanitarian assistance in Syria. Of these, 5.47 million are in hard-to-reach areas, including 600,000 in 18 besieged areas. The UN had hoped to take advantage of the cessation of hostilities brokered by the US and Russia two weeks ago to deliver aid to besieged areas, but subsequently complained that the Syrian government had failed to issue the necessary permits. Jan Egeland, the adviser to the UN special envoy for Syria, accused "well-fed grown men" of putting "political, bureaucratic, and procedural roadblocks" before humanitarian workers willing to help women, children and wounded civilians.